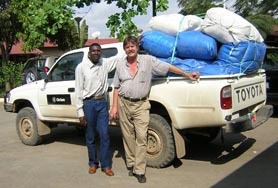 Tako Koning and an Oxfam employee on October 26, 2004 when the AMNP donated 2300 nets to Oxfam, the Norwegian Refugee Council, Development Workshop , the Baptist Mission in Uige. 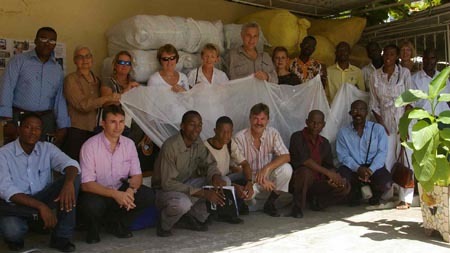 Committee members, donors and recipients of perma-nets, standing in front of bales containing 3500 nets, April 19, 2007. Angola MosquitoNet Project chairperson Tako Koning is a Canadian geologist who was involved with this project since it started in 2000. He worked for 30 years for Texaco beginning in Canada and then globally. When Texaco merged with Chevron, Tako retired but stayed in Angola where he works as a advisor to Tullow Oil and is volunteer Residential Representative for Yme Foundation, a Norwegian NGO carrying out water and santitation projects in northern Angola. Ana Maria Teixeira, MosquitoNet Project Finance Chairperson, joined the project just shortly after it started. As Administration Officer with Norwegian oil company StatoilHydro, Ana Maria has a strong background in accounting and spreadsheets and monitors the project’s finances. Ana Maria is Angolan and has lived in the country all her life making her familiar with malaria and its impact on Angolans. The other Committee members are a mix of Angolans (Gila Alexander, Manuel Soque and Tony Congo) and expatriates (Elizabeth Halliday, Henriette Koning and Laura Farell). With their wide variety of professional backgrounds, the committee members contribute significantly to the AMNP. All photos unless otherwise indicated © Henriette.